Meet Dr. Melanie Erb - Melanie Ho Erb, M.D. Dr. Melanie Ho Erb is a leading expert in Orange County and Los Angeles in non-invasive botox, fillers, lasers, and advanced plastic surgery to the delicate eyelids and face. She is one of very few surgeons double certified as an Oculoplastic Surgeon and an Ophthalmologist. She has performed tens of thousands of oculoplastic procedures, injections, and laser treatments over the course of her career. Dr. Erb’s philosophy is to provide a look that is refreshed and youthful, but also healthy and natural. She achieves this goal using a combination of surgery, injectables, and/or lasers, guided by her gentle touch, artistic eye, and meticulous attention to detail. Dr. Erb performs all of the lasers, injections, and surgeries herself. As a female surgeon, Dr. Erb is able to understand and actualize the wants and needs of female patients. As an Asian surgeon, Dr. Erb is able to recognize and replicate a natural-looking double eyelid. Many men visit Dr. Erb to continue to look both youthful and masculine. Dr. Erb truly hears your wants and concerns. She will reveal your inner vitality to the outside world. Dr. Erb strives to provide the highest quality of care in a welcoming and attentive environment. Her approachability, honesty, and warm bedside manner have earned her both the Patients’ Choice Award and the Compassionate Doctor Award by Vitals almost every year since 2010. Your face is continuously on display, for all to see. And your eyes are the window to your soul. When choosing a surgeon for cosmetic eyelid and face surgery, it is important to consider the physician’s training. Oculoplastic Surgery (also known as Ophthalmic Plastic and Reconstructive Surgery or Oculo-Facial Plastic Surgery) is a specialized field with a total of 6 years in the training of the eyes and eyelids which is the most eyelid training than any other type of cosmetic surgeon. An Oculoplastic Surgeon has spent 4 years in the training of eyes and eyelids gaining certification as an ophthalmologist and then spends 2 more years in Oculoplastic Surgery fellowship in the training of the eyelids and face. Combining knowledge of how to manage the delicate eye with detailed plastic surgery knowledge for the eyelids, an Oculoplastic Surgeon offers the very best experience to ensure the safest and most cosmetically appealing results after surgery. When you consult with an Oculoplastic Surgeon, you a consulting with a true eyelid expert. Why trust your eyes to anyone else? What is the American Society of Ophthalmic Plastic and Reconstructive Surgery (ASOPRS)? 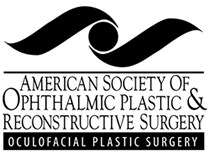 The American Society of Ophthalmic Plastic and Reconstructive Surgery (ASOPRS) comprises an elite group of Oculoplastic Surgeons who have training and experience in the highly specialized fields of eye, plastic, facial, and reconstructive surgery who have passed rigorous requirements to join ASOPRS. First, the surgeon must complete a 2-year fellowship training program which has been approved by ASOPRS as having the proper volume, depth and breadth of training in cosmetic and reconstructive eyelid and facial surgery. These fellowship programs are prestigious and coveted because there are many more applicants than slots available. Each year, only about 20 surgeons in the US and Canada are trained in this field. Furthermore, ASOPRS members must pass a written exam, an oral exam, and write a scientific thesis of original research. Only after all of these steps have been completed is a surgeon allowed to become a member of ASOPRS. Dr. Erb is a full member of ASOPRS, having completed all of these requirements. Around the world, there are approximately 500 such physicians who have passed these rigid criteria for certification.